We went to the grand opening of the Beatrix Potter Garden. Chris Collins the Blue Peter gardener was the guest of honour. 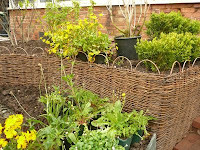 Despite it being a very rainy day the garden looked fantastic and our willow work was much appreciated. The pics are of Steve, some of our weaving and the trio are Richard Lucas (the garden designer), Simone and Chris Coles (BBC Blue Peter). Beatrix Potter is very popular in Japan and China so as well as the ITV border Television filming the opening there was a film crew from China. We loaded the van in readiness for the Game Fair at Pickering Showground this weekend. 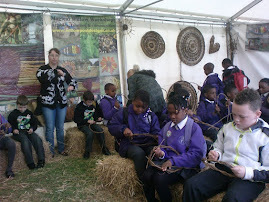 Steve will be demonstrating basketmaking and Simone will be demonstrating willow sculpture. We are hoping for good weather but are prepared for rain.